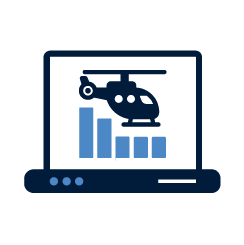 Safran Electronics & Defense offers flight data solutions for Helicopter operators that record, transfer and analyze flight data to simplify the pilot, maintenance and operations workload before, during and after a flight. All Cassiopée helicopter services form a complete digital chain, making it possible to streamline the transfer of data between the ground and on board. Download our digital chain infographic!